The MISCO Digital-Dairy™ refractometers are specifically designed to help professional dairy farmers and calf ranchers to rear healthy calves. They are rugged enough to withstand the demands of farm use, yet precise enough to give laboratory-quality readings. 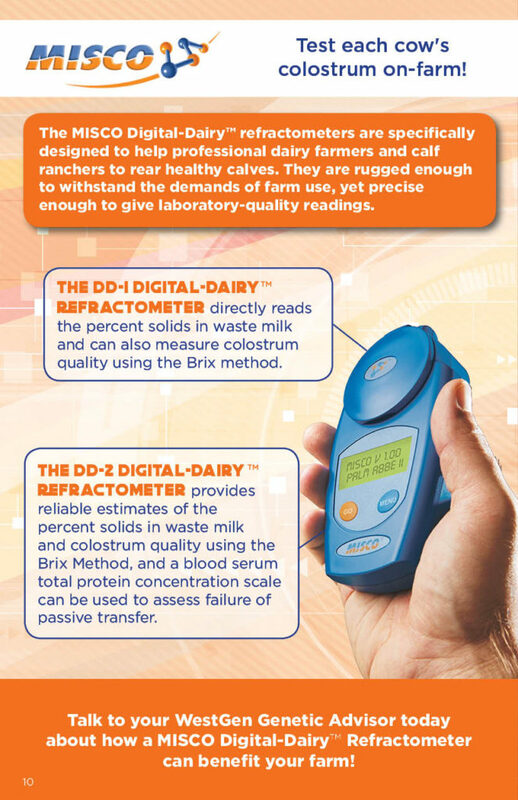 The DD-1 Digital-Dairy™ Refractometer directly reads the percent solids in waste milk and can also measure colostrum quality using the Brix method. The DD-2 Digital-Dairy™ Refractometer provides reliable estimates of the percent solids in waste milk and colostrum quality using the Brix Method, and a blood serum total protein concentration scale can be used to assess failure of passive transfer. Talk to your WestGen Genetic Advisor today about how a MISCO Digital-Dairy™ Refractometer can benefit your farm!